Raw was back on form this week with a very good episode and a concept that meant the three hours didn’t drag as it has been known to do in the past. The majority of matches felt important, and we got some nice story and character development. After a similiarly good episode the Raw after Payback, hopefully WWE will be able to keep this one up, unlike the previous month which trailed off. To kick off the show, new Raw General Manager heading down to the ring, after being introduced by a drum roll. I actually really enjoy listening to Maddox on the mic, his delivery of the lines is amusing and his character, whilst annoying to some, seems well thought out. Maddox announced he would be the best general manager of all time, before WWE Champion John Cena headed out to the ring. Cena’s deliver as he said he would give Maddox a chance as General Manager, was certainly better than we’d seen out of Cena in the build towards his match with Mark Henry, as he took his time and didn’t over act. 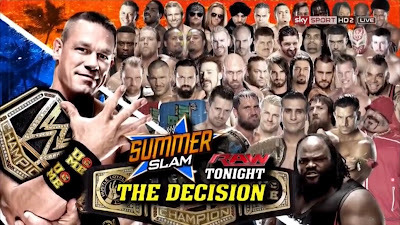 Maddox announced that Cena would be able to choose his own opponent at Summerslam, from here on out at it was obvious that Cena would be choosing Daniel Bryan, but I was happy to go along on the ride with WWE, if we were given the Cena-Bryan story that had been promised. As Cena spouted about possibly facing Michael Cole, WWE Championship Money in the Bank holder Randy Orton came down to the ring, telling Cena he wouldn’t make the same mistake Cena did last year and that when he cashed in the contract, Cena would never see it coming. In surprising move, Fandango was the next person to head to the ring to state his claim for why he Cena should pick him for Summerslam, as well as teach Cena how to say his name. Fandango’s deliver is so ridiculous that it’s actually quite entertaining to watch. Orton eventually attacked Fandango and a match between the two was set up for later on (more on that later). After a number of superstars threw their hat into the ring to challenge Cena during the show, the final segment of the show saw the WWE Champion come out to the ring and throw the decision open to the fans. Going through some of the WWE roster, Cena asked the “WWE Universe” to voice their opinion on each. This was little corny for my liking, as we all knew who was going to get the shot, so going through guys like 3MB and The Great Khali who were clearly not going to main event Summerslam did feel a bit pointless. Cena did however do a good job of playing with the crowd, and it seemed his character had received a slight tweak, saying the crowd was hard on him rather than simply accept it, which will hopefully be a refreshing change to the character we’ve seen for the last three years or so. Cena eventually threw it open to the crowd for one finally opinion, getting a clear answer in the form of a resounding “YES!” chant from the Brooklyn crowd. Cena teased he might pick someone else, but of course choose Daniel Bryan! Bryan came charging down to the ring, with his signature “YES!” taunt all the way down the ramp, including right in Cena’s face to end the show. It was a nice way to finish the show and set up the match well, with a lot of room left to tell a nice story between the two over the next couple of weeks, hopefully we’ll get some imagination thrown into the rivalry, and it can keep its momentum heading into Summerslam, because if it does we could be in for a special match at the Biggest Show of the Summer. The thing that blew me away during this segment was the unbelievable reaction that Brooklyn gave Daniel Bryan. We’ve seen Bryan get some great reactions over the last few months, but this was something else, with almost the entire arena chanting Yes with Bryan opposite Cena. I’m interesting to see how WWE will go in terms of dynamic for this rivalry, with Bryan clearly the fan favourite, managing to appeal to almost all sections of the audience at once, something Cena hasn’t done for his entire WWE reign, this match is already feeling like somewhat of a passing of the torch. Hopefully, Bryan will be able to pull something out of Cena we haven’t seen in a while, something that was missing from Cena’s rivalries with Ryback and Mark Henry, and to some extent The Rock, which is a little bit of imagination, and hopefully the writing team will follow suit. After the events at Money in the Bank seeing Paul Heyman turn his back on CM Punk, repeatedly hitting him with a ladder and costing him the All-Stars Money in the Bank Ladder Match, CM Punk headed to the ring to call out Heyman and client Brock Lesnar. Heyman came out, and cut an unbelievably good long promo, that was not only some of the best work of Heyman’s latest WWE run, but some of the best work of his career. Heyman took us on a journey, telling us about his relationship with CM Punk and how Punk had in fact turned his back on him. The reason it worked so well for me was, not only Heyman’s excellent delivery but the fact that you could understand Heyman’s point of view and motivations seemed to come from a real place. With Heyman saying that Punk couldn’t defeat Brock Lesnar, WWE showed it’s hand for what was about to come, not that I’m complaining, it simply built the anticipation for Lesnar to come out. Punk replied with an equally good promo, with his facial expressions and intensity really telling the story and showing the deep feelings that Punk was feeling. The way Punk delivered the promo made it especially easy to get behind him and want him to get his revenge on Heyman, because it felt like it actually meant something to Punk, something that is often missing from WWE rivalries. With the Best in the World saying that Heyman would have no future, Heyman dropped to his knees, and shouted out Punk’s signature phrase “It’s Clobberin’ Time” as Brock Lesnar’s music hit and out came the beast incarnate. With Lesnar heading down to the ring, Heyman snuck into the ring to ambush Punk from behind, allowing Lesnar to take control. Any worries that the brawl between these two would not live up to the talking that had gone on before, were thrown out of the window within about three seconds. The brawl was well thought out, with Lesnar looking strong and Punk defiantely fighting back against the bigger man, which definitely allowed the crowd to get even further behind Punk and made Punk look a credible threat for Lesnar when it comes to Summerslam. Seeing Punk get up after being thrown over the announce table and then get back up to fight Lesnar again, sold the feeling that Punk had for Lesnar and what Heyman had done to him. The segment finished with Lesnar finally seeing Punk off, sending him back first into the ring post and hitting an F5 onto the announce table, with Lesnar and Heyman leaving together. Ending in this way, helps to build the audience’s connection with Punk and will increase the buys for Summerslam as the buyer will want to see Punk finally show Lesnar up. Punk, Heyman and Lesnar conspired to create on of the most exciting and well worked segments in the recent history Monday Night Raw, with every little detail seemingly being thought of and the story being told feeling like we were watching an epic adventure. In Punk, Lesnar finally has an opponent that will allow him to get full heel heat, that he is struggled to get when positioned against John Cena and Triple H, simply because neither Cena or Triple H were presenting a particularly likeable character and I had no real desire to see either get one over on Lesnar. With this, as well as the Ziggler-Del Rio story, WWE has finally positioned a likeable face against a dislikeable heel, where I want to see the face get his revenge, fully buying into the kayfabe, which is surely wrestling’s number one aim. If only they could do this with the likes of Sheamus and The Miz. This match was made by new General Manager Brad Maddox, when Chris Jericho went into his office, with some nice comedy ensuing with Maddox and Jericho bouncing off each other well. The reasoning behind the match given by Maddox was to give Jericho and opportunity to impress WWE Champion John Cena into potentially picking him as a Summerslam opponent, which was neither here of there really, as after seeing Jericho lose two straight Pay-Per-View matches to CM Punk and Ryback respectively, it was highly unlikely he’d be headlining the biggest party of the summer. 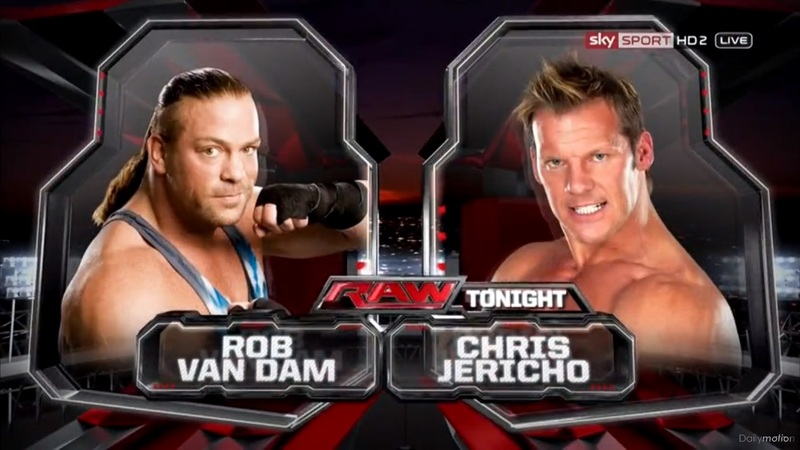 This match seemed like a good decision by WWE for a number of reasons, firstly having Rob Van Dam’s first singles match back for WWE, hopefully drew in some decent ratings, and secondly in placing Jericho opposite Van Dam, you Van Dam had been in action against before, so knew his style and move set, whilst also having someone who is known for pulling out good matches from all manner of opponents, and with Van Dam’s poor three year span in TNA, there were certainly question marks hanging of the head of Mr. Monday Night. For me, the opening of the match was a little sloppy , with Van Dam looking a bit out of it, not surprising seeing the amount of staples that he had in his head. Van Dam took an awkward bump out of a slingshot from Jericho into the corner, where I’m not even sure Van Dam knew what he was trying to do, Jericho did his best to cover up with a quick pin cover, even if RVD’s arms were both under the ropes. The pace of the early part of the match up was uneven, making that sections difficult to watch, as at times that match would stop randomly and Jericho spent a long time in Van Dam’s leg scissors, which for some reason warranted a “This is Awesome” chant from the Brooklyn crowd. The match however did begin to improve as we headed into a commercial break with some nice work from both RVD and Y2J, as Jericho moved out of the way of a Rolling Thunder only for Van Dam to hit a springboard moonsault to the outside. After this, Van Dam seemed to feed of the crowd, something he was unable to do during his TNA run, with the flow of the match seeming to click into place with a ton of quick reversals and a number of Van Dam and Jericho’s signature spots. Moments like RVD missing a split legged moonsault, followed by Y2J missing a Lionsault were clever and well done, helping to build this match into something special as we headed towards a finish. The end saw Jericho get RVD in the Walls of Jericho, but with Van Dam getting to the ropes and the referee moving Jericho off him, this allowing Van Dam to hit a spin kick and head to the top rope to finish of his opponent with a Five Star frog splash. The only problem I had with this ending was Van Dam took a little bit too long with the “RVD” taunt and Jericho had to stay down for a long time to sell a spin kick which didn’t exactly make Jericho look great heading out of the match. Overall, a decent contest with a poor beginning and a great ending that showed promise for Van Dam. For me, the jury is still out on Mr. Monday Night, and I’m interested in seeing what WWE has in store for both he and Jericho at Summerslam. There was also a rematch of the previous night’s World Heavyweight Championship Match with Dolph Ziggler facing off against World Heavyweight Champion Alberto Del Rio. Before the match, we saw Ziggler and girlfriend Diva’s Champion AJ Lee dissolve their relationship with Dolph saying it was time for them to go their separate ways, after AJ cost Ziggler the World Heavyweight Championship at Money in the Bank. Splitting Dolph and AJ up makes a lot of sense, with Ziggler’s face turn, AJ was now holding him back in terms of getting further over as a face, and AJ Lee doing a good job as the Divas division top heel, the two were clearly moving in opposite directions. The match took a similar pattern to the one we saw at Money in the Bank, with Del Rio dominating for most of the match, and Ziggler doing a fantastic job as usual selling really helping me to buy into his comebacks, Ziggler certainly seems to have the sympathetic face character nailed on, whilst still keeping the elements of the character that made him so popular as a heel, which is rare in WWE. Ziggler’s ability to take ridiculous bumps, such as the one that saw Ziggler take huge back body drop to the arena floor, brings a certain “Wow” factor to his match, as at times you can’t quite believe what you’ve seen. Ziggler will obviously need to tone this down, as there is no way he can have a prolonged run at the top of the card, whilst continuing to take bumps of the nature. With a number of false finishes thrown in towards the end, the actually ending was another frustrating one, with Ziggler hitting a Fame Asser performed out of the corner, the bell was rung before Ziggler could pick up the pin. It was revealed, of course, that AJ was the person who rang the bell, and with Ziggler distracted Del Rio hit a superkick to pick up the victory. With AJ breaking into a rage on Ziggler, Big E Langston headed down to the ring and finished off The Show Off with a Big Ending. Whilst, I would expect Ziggler and Big E to put on a good contest, I hope WWE allow the Ziggler-Del Rio story to reach its natural conclusion at Summerslam with Ziggler winning the World Heavyweight Championship. The Wyatt Family also continued their path of destruction this week, choosing R-Truth as their last victim. As R-Truth returned to his signature rap that made him popular, I began to wonder the last time that we saw R-Truth, especially in terms of a big segment on either Raw and Smackdown, the last time he was even close to relevant was during his rivalry with Antonio Cesaro over the United States Championship around the TLC: Tables, Ladders and Chairs review back in December. Therefore as a choice as a victim of The Wyatt Family, he didn’t exactly pose as much of a sentimental favourite, but neither did he look to particularly loose anything for being taken out by WWE’s newest stable, I wouldn’t be completely surprised if Truth is sent packing by WWE soon. Bray Wyatt then had some time to speak on the mic, and for me this wasn’t quite as good as the promos he’s produced on NXT. Don’t get me wrong, it was another well-crafted and creepy promo, but it seemed to me that Bray was suffering from slight nerves, in his biggest moment so far in WWE. This meant the promo was felt a little bit rushed, and Wyatt needed to take his time and keep to the deliver that had made him so popular in NXT. He’ll get there eventually as he clearly has a lot of talent, but it will take a little bit of time for him to get used to performing promos in front of those kinds of crowd. The promo ended with Truth attempting to make a comeback, only for Wyatt to tell Rowan and Harper to leave the ring, as he quickly dispatched of the former United States Champion with Sister Abigail. Wyatt went onto call out Kane, after last week’s attack, a full on Bray Wyatt-Kane rivalry heading into Summerslam could be a very interesting one, and I’d expect a lot of creepy promos and a lot of Science Fiction elements thrown, which will of course give this rivalry something different to everything else happening in WWE at the moment. In the previously mentioned Randy Orton and Fandango match, we got an interesting dynamic between a seasoned main eventer and an up and comer, with Orton’s no nonsense face role suiting Fandango’s flashy, dancing heel. I was certainly surprised by this one, as I expected Orton to hit a quick RKO and pick the victory, fortunately that wasn’t the case as we got a fairly lengthy television contest, that allowed Fandango to get in a good amount of offense, including sending Orton into the steel steps before a signature show boat session. Orton did eventually pick up the win, after thwarting a tope rope leg drop attempt from Fandango, and hitting a rope hung DDT, followed by RKO. Fandango may have lost, but spending time against a proven main eventer will only help to raise his star within WWE, and on this display he certainly deserves it. Triple H and Stephanie McMahon also dropped by to catch up with Brad Maddox on his first day in charge. I struggled to see the point of this segment, mostly because it pretty much gave away the finish to the show, with Triple H saying Cena’s choice would upset Vince McMahon, with Vince clearly showing dislike for Bryan on previous shows, it really did sign post the finish, in a segment that added little to the overall show. Hopefully, the McMahon family angle will not get involved in the Daniel Bryan-John Cena WWE Championship match, as whilst you have clear sides Vince and Triple H could take here, it really would take the edge of the match to murky the waters with The McMahons. The newly crowned Smackdown Mr. Money in the Bank Damien Sandow was also in action against Christian. The bout was a cut down version of the match these had on Main Event a few weeks ago, with Christian managing to outsmart Sandow on a number of occasions, eventually getting the win whilst Sandow attempting the Cubito Aequet, Christian tripped him up and stole a roll up victory. There’s only so much that can be done in a three minute match but Sandow and Christian did a fairly good job here, but it obviously couldn’t live up to their previous encounter. After the match Sandow’s former Team Rhodes Scholar’s partner and best friend, Cody Rhodes attacked Sandow, having to be pulled after by a group of referees and Sandow escaping through the crowd. Rhodes and Sandow could be in for a very good rivalry with a lot of ground for WWE to cover and it could run for a few months it handled properly, Sandow vs. Rhodes looks like another possible addition to an already strong Summerslam card. Elsewhere, Mark Henry was out to talk about his loss to John Cena on the previous night, putting over Cena as the greatest WWE Champion of all time, and as Henry threw his hat into the ring to face Cena again at Summerslam, the familiar music of The Shield hit and United States Champion Dean Ambrose and Tag Team Champions Seth Rollins and Roman Reigns headed down to the ring. The World’s Strongest Man fought off The Shield for so long, until the numbers game got the better of him and he eventually received a triple powerbomb, which was once again visually impressive. It would appear that Henry is turning face due to his comments about Cena and then subsequent attack, this was really WWE’s only real option for the World Strongest Man, after having him lose to Sheamus and John Cena cleanly in recent months. In part of a WWE App poll vote the “WWE Universe” choose The Usos over Tons of Funk and The Prime Time Players to face The Real Americans. Zeb Colter, of course got to cut a pre-match promo, personally I think it’s time to drop these promos, as although you can’t really criticise Colter’s delivery, but we seem to go over the same ground each week, unless WWE gives Zeb something new to say or a story to tell with Cesaro and Swagger then keep him quiet, it will have more effect when he does speak. The match was over surprisingly quickly, with Swagger and Cesaro dominating using their power advantage, The Usos countered with speed, with Jimmy reversing a Gutwrench from Cesaro into a roll up to pick up a quick victory. This match really needed longer than two minutes to show what these four guys and can do, hopefully The Usos are heading into another title match with The Shield and WWE actually has something for Cesaro and Swagger to do! WWE also managed to get some promotion in for their new Total Divas show, as Naomi of The Funkadactyls, took on Brie Bella. Now I couldn’t say I was particularly excited to see this contest, about as excited as I am about the new Total Divas show. In fact, however this was some fairly decent fare with Naomi particularly impressive, with some technically sound offense and a beautiful dropkick, even if Brie struggled to take it. It must be said that The Bella’s do make good heels somehow, despite their limited wrestling and acting ability, playing the obnoxious women role that I think all men have encountered at some point in their life. Naomi eventually picked up the win after a top rope crossbody. Hopefully, The Bella’s aren’t about to be thrown into the Cena-Bryan match at Summerslam simply to promote Total Divas, whilst Naomi gets more opportunities to show off her in ring ability against higher calibre opponents soon. What have I learnt from this week's Raw? 1. Daniel Bryan is now the most over wrestler in the company. 3. Rob Van Dam can still go when he wants to, but he needs to feel that buzz from the crowd first.